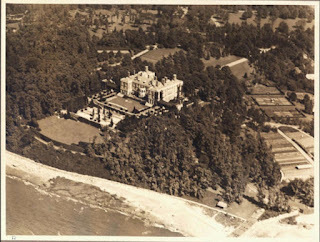 'The Braes', the Herbert L. Pratt estate designed by James Brite of Brite & Bacon c. 1912 in Glen Cove. Click HERE and HERE for more on the residence and HERE to see what the estate looks like today as the Webb Institute. Photo from the Ryerson & Burnham Archives at the Art Institute of Chicago. oooh, aaah, the only sounds I would utter if I was lucky enough to be in that plane gliding over Long Island's north shore.